Morgan City, La., is the shipbuilder for the project. One of the boats, the Destiny, is a 120- foot (36.6-meter) vessel with four 535-horse- power diesel engines. Each of the other six boats will be 100 feet (30.5 meters) in length and have three of the 535-horsepower diesels. Three of the vessels were delivered last year, and the other four are expected to be delivered by this August. Title XI guarantee will cover 75 percent of that amount. All American Marine Slip (AAMS) has named Jerry Vasquez administrative assist- ant at its New York, N.Y., home office. Mr.
American Marine Slip is a syndicate of 31 insurance and reinsurance companies that insures high value, offshore energy risks, managed by Marine Office of America Cor- poration. A senior underwriter since 1978, Mr.
Vasquez has 10 years' experience in insur- ance, six of those with the MOAC organi- zation. 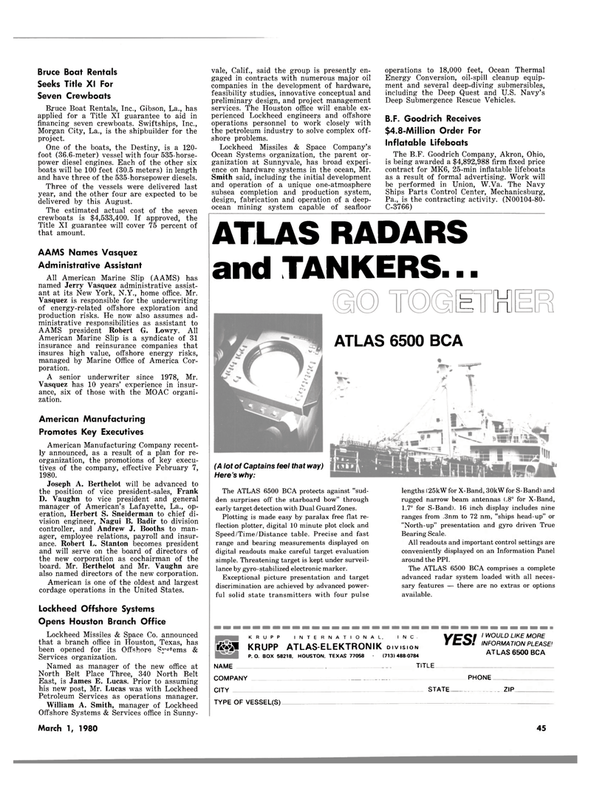 American Manufacturing Company recent- ly announced, as a result of a plan for re- organization, the promotions of key execu- tives of the company, effective February 7, 1980. D. Vaughn to vice president and general manager of American's Lafayette, La., op- eration, Herbert S. Sneiderman to chief di- vision engineer, Nagui B. Badir to division controller, and Andrew J. Booths to man- ager, employee relations, payroll and insur- ance. Robert L. Stanton becomes president and will serve on the board of directors of the new corporation as cochairman of the board. Mr. Berthelot and Mr. Vaughn are also named directors of the new corporation. American is one of the oldest and largest cordage operations in the United States. Petroleum Services as operations manager. Offshore Systems & Services office in Sunny- vale, Calif., said the group is presently en- gaged in contracts with numerous major oil companies in the development of hardware, feasibility studies, innovative conceptual and preliminary design, and project management services. The Houston office will enable ex- perienced Lockheed engineers and offshore operations personnel to work closely with the petroleum industry to solve complex off- shore problems. Ocean Systems organization, the parent or- ganization at Sunnyvale, has broad experi- ence on hardware systems in the ocean, Mr. The ATLAS 6500 BCA protects against "sud- den surprises off the starboard bow" through early target detection with Dual Guard Zones. Speed/Time/Distance table. Precise and fast range and bearing measurements displayed on digital readouts make careful target evaluation simple. Threatening target is kept under surveil- lance by gyro-stabilized electronic marker. All readouts and important control settings are conveniently displayed on an Information Panel around the PPI. The ATLAS 6500 BCA comprises a complete advanced radar system loaded with all neces- sary features — there are no extras or options available.